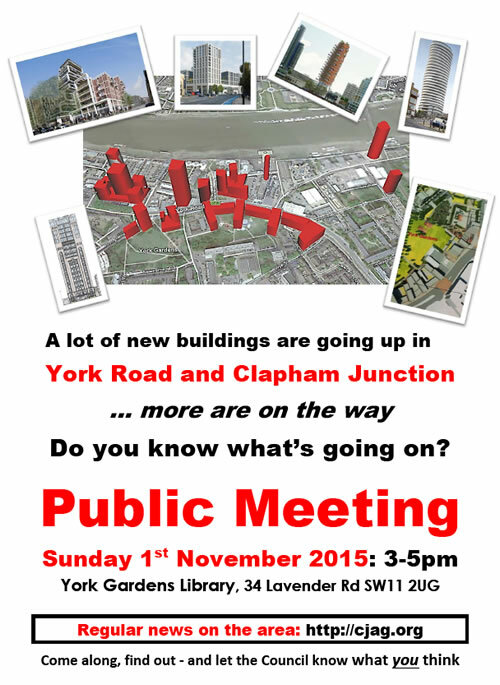 On the 1st of November, more than 90 people attended the Public Meeting organised in York Gardens library by CJAG, in order to talk about the developments planned for York Road, Lombard Road and Clapham Junction area. This was also a very good opportunity to talk about the general planning strategy, implementation of planning policies by the Council. We had 4 speakers: Tony Belton (Councillor for Latchmere Ward), Philip Whyte (chair of the Planning Group in the Wandsworth Society), Andrew Duncan (Plantation Wharf resident) and myself, Cyril Richert (chair of the Clapham Junction Action Group). Councillors of St Mary’s Park were invited several time but they either declined or ignored the emails. For those who missed the meeting (or even liked it so much they want to have it again 🙂 ) it is now possible to catch up and watch most of it on video (get a cup of tea, it is nearly 2 hours long!). If you have friends interested but did not have the chance to attend, feel free to forward the link to our video page: http://www.dailymotion.com/cjagroup. In order to be able to report to specific sections of the meeting we have cut the videos into several parts below. Area: The new focal point proposal (F) looks like an attempt to complement all available land between Clapham Junction Town Centre and Wandsworth town centre and set up a blanket policy to transform the full area into a high-dense and tall buildings zone. 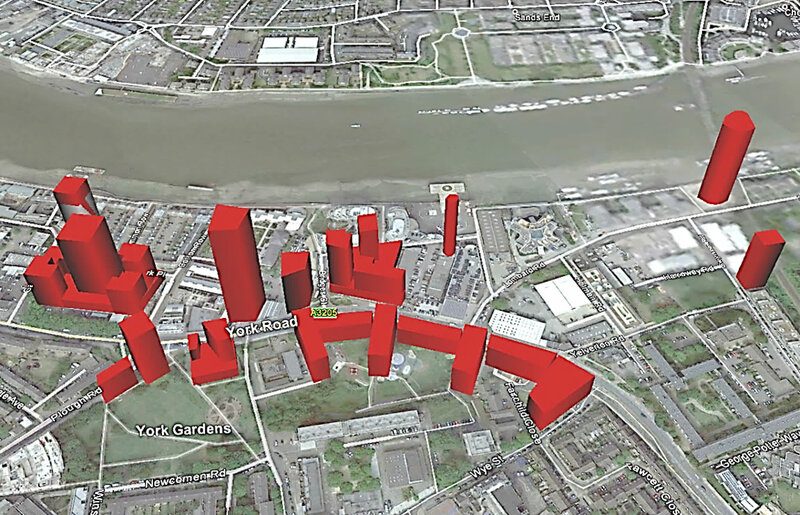 In more than 60% of the sites, current vacant sites, warehouses or 1-2 storey industrial buildings have proposals to be replaced by 17, 20, 21, 28, 30, etc storey towers. 60% of the sites are in breach of current planning rules. What do you do? For the Council the answer is obvious: you change the rules! Impact: We could get more that 2500 units for the area, which might convert into more than 5000/6000 additional residents using local amenities and transport facilities. Until the Council presents a global vision for the area, with an impact analysis, and get the consent of the residents for their clear project, any such plan of filling patchy areas should be strongly restrained. A government inspector reviewing Wandsworth Local Plan said that the Council’s planning documents are “not effective and need to be reinforced“. The Council considers that whoever is following the boroughs planning rules and criticises planning decision is a Nimby, and should be ignored. Wandsworth is unable to meet its target of 33% affordable accommodation in every new development. A member of the cabinet explained that if you want improvement in your area, you have to accept larger developments, as improvements will have to rely on Community Infrastructure Levy. He is also referring to planning application 2014/7344 56-70 Putney High street which was unanimously rejected by Wandsworth Council planning committee last July but granted by the Mayor of London office (partly based on the fact that, for once, it was following the SSAD on the size of the building being 6 storeys). >>> More on the the Putney’s proposal HERE. If you want to contact Andrew, please use this site and/or comment boxe. From the reactions to the meeting it was cleared that people need to be reassured that their views are shared by many and that there are different groups and organisations helping communities in the borough. Several times the audience brought up the need of cooperation between those different groups. This is indeed what we have been advocating for many year here at the Clapham Junction Action Group. Without doubt people consider that we are stronger together and they are right. The Clapham Junction Action Group as worked with other groups in several important occasions. In 2015, the Putney Society, Wandsworth Society, the Clapham Junction Action Group and Friends of Putney Common community group have all written to the Prime Minister to express their concerns at the way Wandsworth Council has dealt with a number of important planning applications, in the context of published planning policy documents and guidelines. (see article HERE). This is actually after this work that the Council accused the groups of being Nimbies! In addition we are in regular contacts regarding planning policy review procedures and liaised before the government inspector hearing session in July 2015. More can be done surely and we will put efforts in continuous liaison within the different groups willing to work with us. If you want to participate, feel free to contact us (if you encounter difficulties with the comment box – it happens – please leave a comment and we’ll contact you). You are also welcome at our committee meeting every 2 months as we need regular members to help in our responses to the Council consultations and agenda. Again, big thanks to everybody attending. This entry was posted in Clapham Junction, Videos, York Road area by Cyril Richert. Bookmark the permalink.